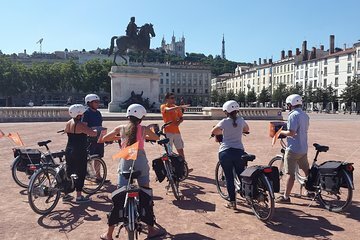 Glide around Lyon’s UNESCO-listed historic center on an easy-to-use electric bike with this 1.5-hour guided bike tour. Cruise along the banks of the Rhône and Saône rivers, pedal around the lush Tête D’Or Park and zip through the dazzling Croix Rousse tunnel, with its unique sound and light show. Stop along the way to admire landmarks like Lyon Cathedral, stroll around bustling Bellecour square and discover little known monuments and local haunts. Tour was great, but our tour guide was late so we walked around to see if we were at the right place. The guide came and apologized for their lateness. The guide was very knowledgeable about Lyon history. The bikes were easy to ride and we were allowed to ride as fast as we wanted through the tunnel. The city of Lyon is beautiful. A group of 6 of us booked this tour as a way to explore Lyon and learn a little history behind the city. We were not disappointed. Our tour guide spoke perfect English and the pace he set was good for us. None of us had ever been on an electric bike before this tour, but it was great fun. I don't ever want to do a normal bike tour now I've experienced the ease of the electric ones. We had a full fun filled 1.5 and saw all the sights in the description without it being rushed. We had two guides to make sure road crossings were safe but in general Lyon has been made very bike friendly and you mostly use bike paths. After doing our research, it was competitively priced. Would definitely recommend. Oliver was a great guide for us, and the bike ride was so fun! When we went, it was a histically hot day. Lyon tempreture went up to over 40c. But Oliver led us around, and tried to find shades to explained history of Lyon and its Venetian influence. Although it was hot, we had great fun! Highly recommended this tour. Great tour! We had 10 adults ranging from 30 to 68 years and 3 kids. The 9 year old rode a kid bike that was not electrical, and the 5 and 6 year old sat on child seats in back. We had 2 guides since we were such a large group and they really concentrated on safety for all of us. Really enjoyable tour which provided some unusual and basic knowledge of the city. Etienne was charming and his English was very good. He also helped us with directions for later on in the day. Thoroughly recommended and at a reasonable price too. Un moment très agréable, découverte du vélo électrique EXCELLENT et de la belle ville de Lyon accompagnée d'une excellente guide très passionnée. Super activité ! Nous avons eu un très beau temps et 2 guides au top. Bonne expérience avec les vélos électriques, une belle découverte. Je vous le recommande ! Découverte du vélo électrique avec un guide super et un parcours très intéressant. Ce fut une très belle expérience que je recommande.